Well…..apparently my blogging has gone down hill. I started writing this while I was still in India and didn’t finish it (so the first bit will sound like it was written while I was still there). I’m home in Canada now and will recap my last month away. I’m sorry to everyone who has been following along and wondered what happened. The biggest reason I haven’t had a post in a while is because I am spending even more time socializing with the clients and staff. 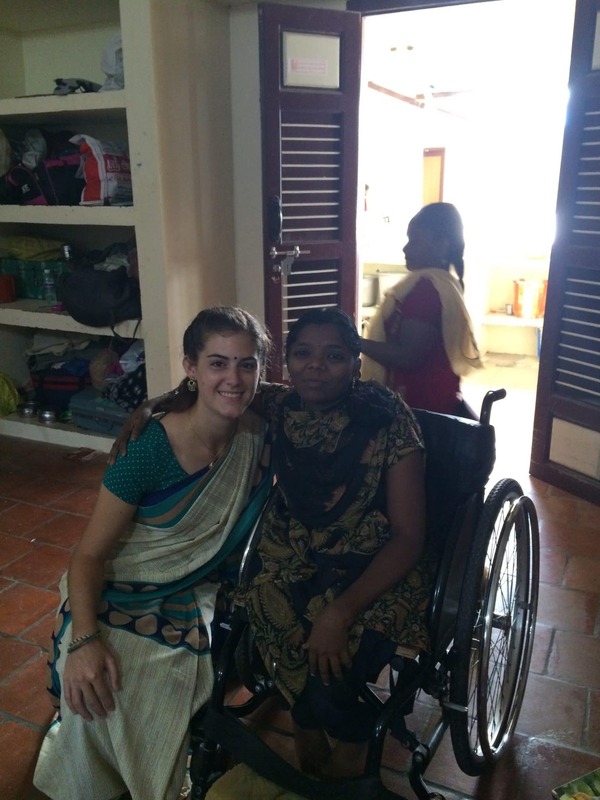 The trip to Bangalore along with our length of time here at ASSA has created some great friendships with people. I’ve opted for spending more time walking around and chatting with people outside of the guesthouse rather than sitting on my computer updating everyone on my whereabouts. We also have 4 new PT students here from Manitoba that has created quite a different environment at the guesthouse, along with a volunteer OT from Canada, bring our numbers to 9 foreigners. I think this is the most foreigners that have been here in a while, if ever! I also think that I am getting used to how things run around here, so I find it more challenging to think about what would be interesting for people in Canada to read. It has been a neat experience since more Canadian’s have arrived because I have realized how much I have learned about both the culture and the way things run here on campus. Steph and I feel very comfortable with things here from what to wear, how to eat, and how to socialize with people to feeling comfortable with the schedule of work, and being able to navigate around town. As my time is winding down in India I am trying to soak up every last second of the experience because I know I am leaving soon. I have such a huge love for this tiny bit of India that I have come to know in a way that I could have never imagined if you asked me before I arrived. My days seem very comfortable now and I mean that in the best way possible. Although things are never predictable, the organized chaos seems very normal. I feel comfortable walking around, I talk to people as I pass by them, the same as I would at home if I saw someone I knew. I finally feel like I am understanding things and fitting in, just in time to have to think about wrapping up and completing my time here. 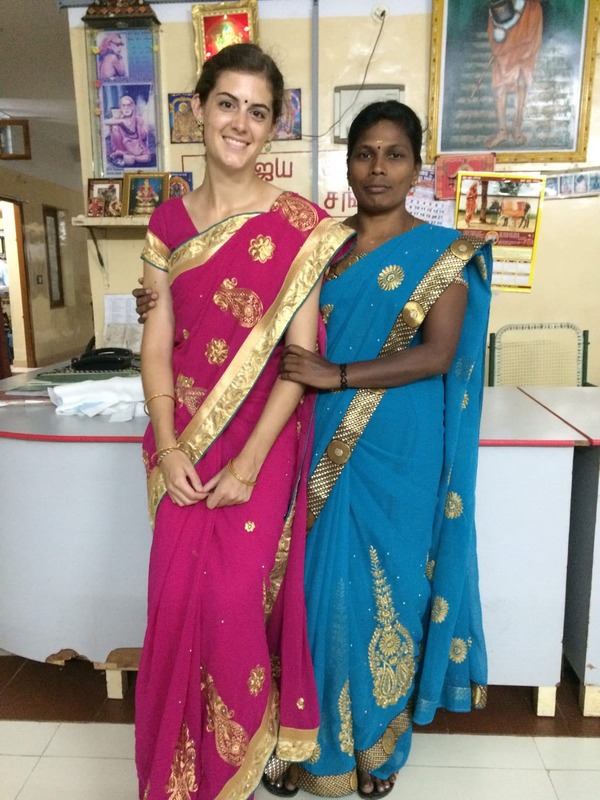 Here is an example of how happy I am to feel like I am fitting in here, and to bring some excitement to this blog post….Last week I attempted to put on a saree all by myself. If you can’t appreciate how difficult it is to put one on, don’t just youtube it, try it for yourself! It is no easy feat for a foreigner. 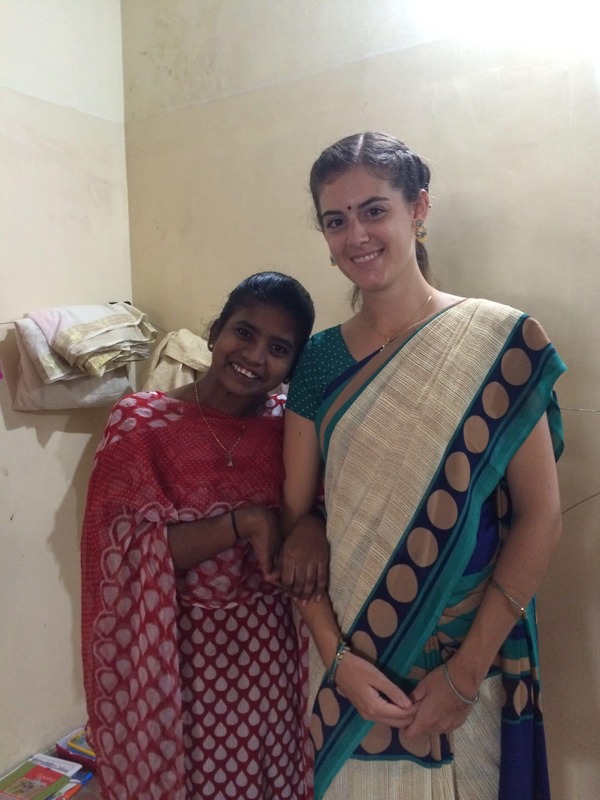 I was successful enough to get my saree on and walk across campus to the women’s hostel where I knew I would need help touching it up. I feel like I may have accomplished the equivalent of an 8 year old dressing themself, but I was happy with that! My first sign that I was successful was that it looked somewhat the same as it did the last time I had someone dress me in it. The second sign that I was successful was that I didn’t get any comments or strange looks as I walked across campus. And the third sign that I was successful was once I got to the women’s hostel I had to actually ask someone for help to fix it up, as opposed to an instant look of horror and having them immediately start fixing things for me. First the women asked who helped me get dressed – as in “they didn’t do a great job, you shouldn’t use them for help again”. But when I told her that I put it on myself, she clarified the question multiple times as if I had misunderstood the question. Once she realized that it was actually me, she became so animated and was so impressed that she started “showing me off” by gathering everyone within the vicinity to tell them that I actually put it on myself. I always get a very positive response from people on campus when I wear a saree because they really appreciate the effort of wearing traditional clothes. They seemed to be even more happy that I went to the effort to learn how to put it on. She kept saying “training, training” and really wanted to help me learn. Everything above was written while I was still in India, and I don’t want to change anything because if I do it will likely take away from the emotion and feelings that were written in the moment. 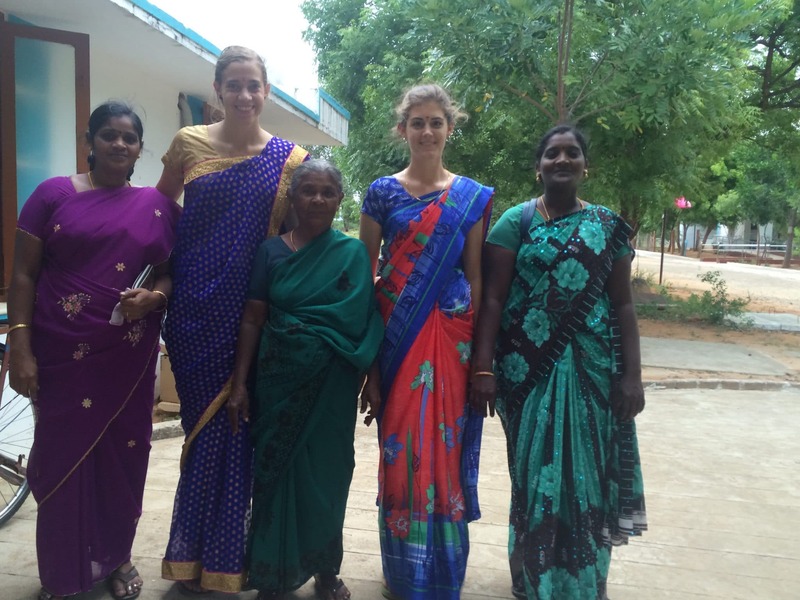 The saree experience and the bond I formed with the women who lived on campus grew even stronger in my last month at ASSA. 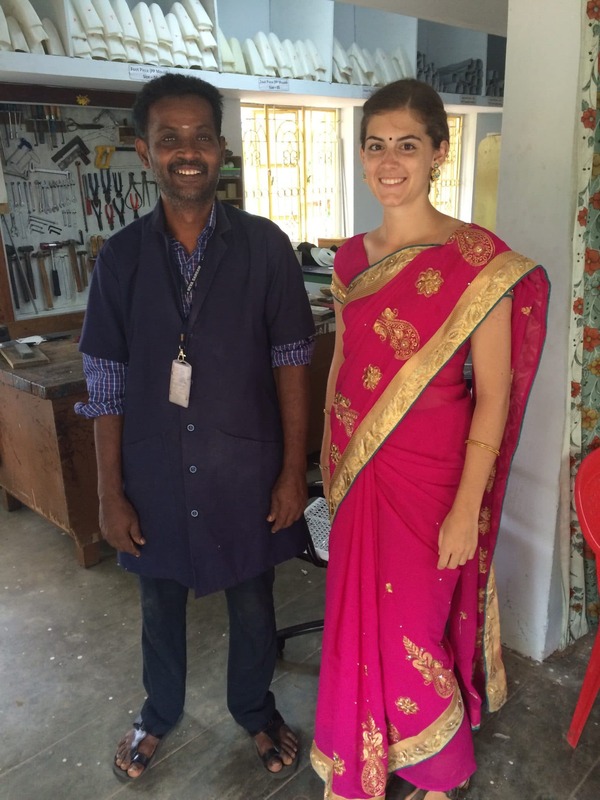 I ended up wearing my saree once a week and would go there in the mornings to get the final touches done by them. They would give me earings and necklaces to borrow and were so happy to dress me up. At the beginning of my last week while I was spending time with the women in their hostel, one of the girls went into her bag and offered me one of her new sarees as a gift. I was so overwhelmed with her kindness and didn’t want to accept the gift, as I felt like I was the one who wanted to show my appreciation for their help during my time at ASSA. But I knew that culturally, accepting the gift was the best way to show my appreciation, and the saree was so beautiful there was no way I could say no! Thankfully, with the tailoring department on campus, I was able to get the blouse (shirt) part made and ready before the end of my time at ASSA. I ended up wearing it on one of my last days on campus and felt so happy all day, just realizing how grateful I was for all the amazing people I had met and how kind they all are. They also gave me a beautiful henna design on my one hand that still hasn’t worn off yet. Usually henna is done for occasions such as weddings, but again, the women just had too much fun dressing me up and I was happy have the henna done! 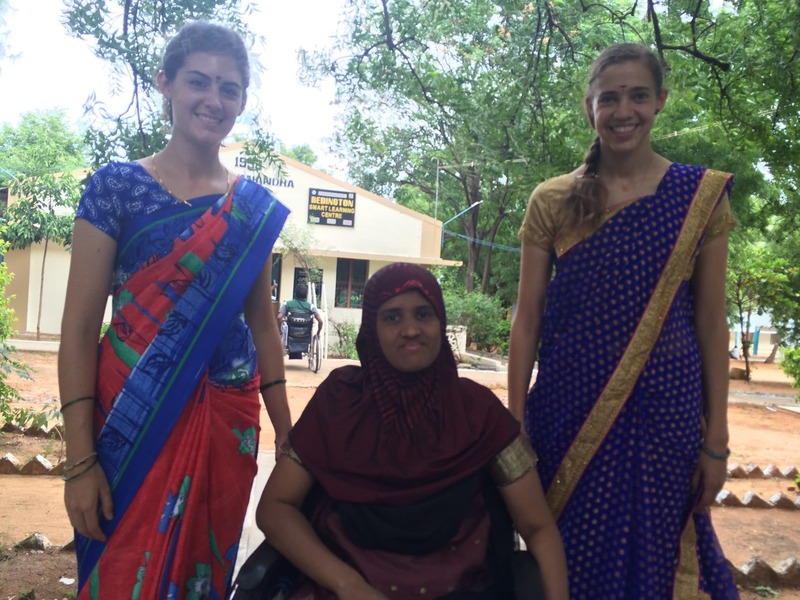 I will add some saree pictures from the last month of my time on campus and follow this blog up with some posts recapping things that happened in my last month. 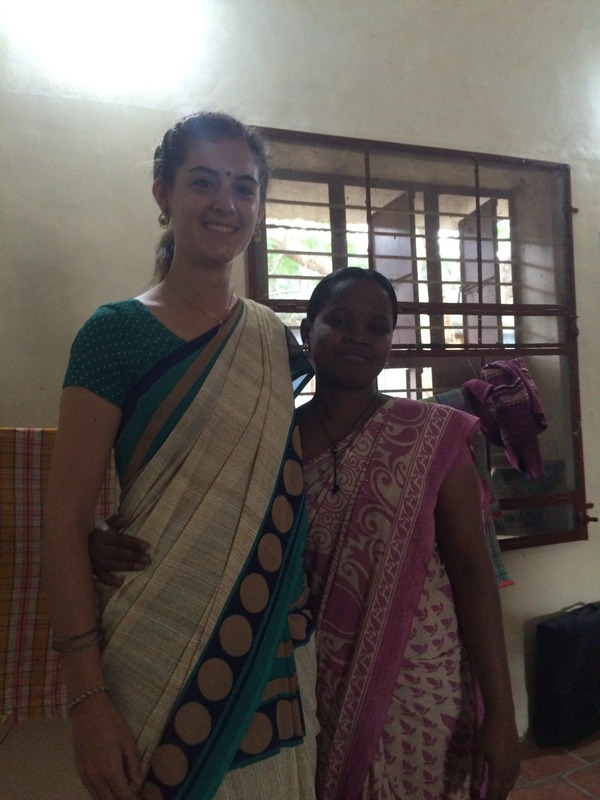 Sree, who helped me buy my saree. 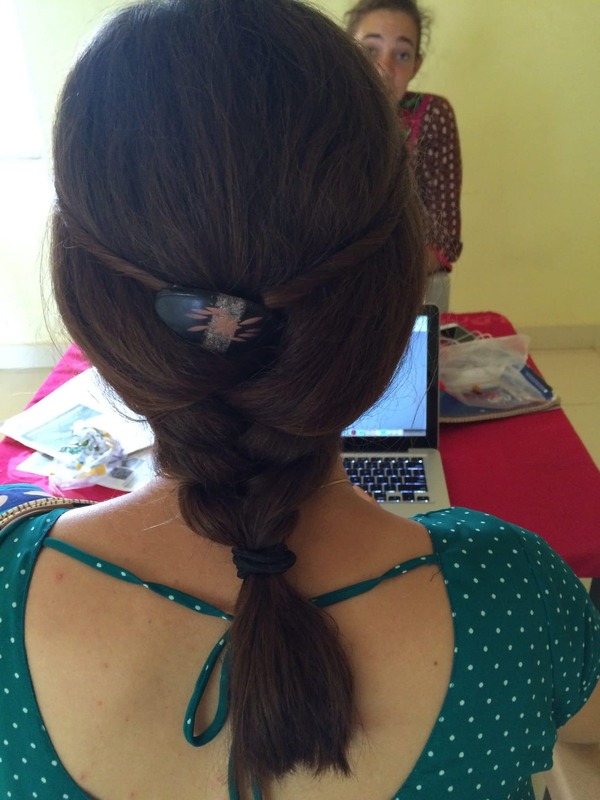 Trying a more south Indian hairstyle – I wish I kept my hair long! 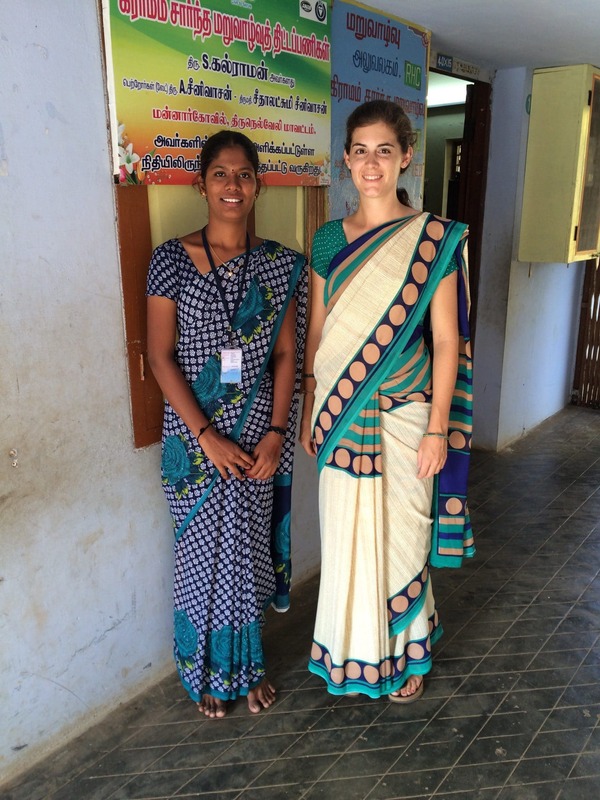 Latha – one of the first women I met when I arrived at ASSA. One of the workers at the caliper unit who was always so helpful. 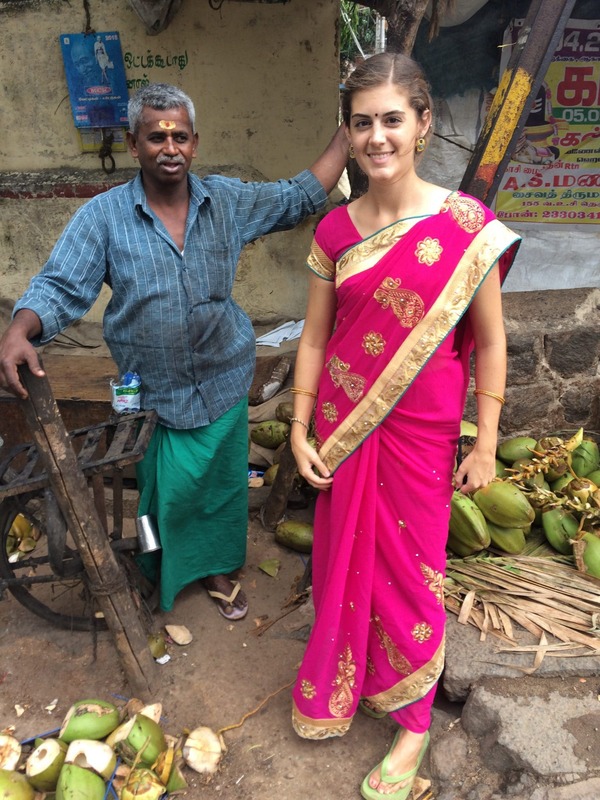 Our last visit to the coconut man in Tenkasi! Ferida – another wonderful friend I made in my time there. The family members of one of my clients who insisted we all take a picture together. Beautiful pictures. You look amazing in their serene? I AM YOUR GRANDNA FIRTUNAS SISTER, what an amazing time you are having.